“Dear Jay Thank you for the link to FETE, I went to Staple and print copies directly from the internet, came out beuatiful, I’m using these for a comprehensive booklet to sent to my relatives here and Italy. I was able to read for the first time the article of Lee Ann, I need to tell her that was the best i ever had , was precise and well written. I have a print foe both of you genius. if you can, come by, thanks so much. I’ve had the pleasure of doing this professionally for many years now and while I’ve gotten many compliments over those years, this is one of the most heartfelt words of praise I’ve ever received. Renato Moncini is a dear sweet humble gentleman who was a pleasure to interview and whose work captured NASA and its many space shuttle launches during the height of America’s space race. If you missed reading the piece when it was originally published in Fete Greenville, here is the Renato Moncini story. I would love to hear your comments after reading about this amazing and interesting man. This entry was posted in Fete Greenville, Uncategorized and tagged Cape Canaveral, fetegreenville, Greenville SC, Huntsville AL, Marshall Space Flight Center, NASA, Renato Moncini, TLNorris Gallery on July 17, 2013 by Lee Ann Carter. 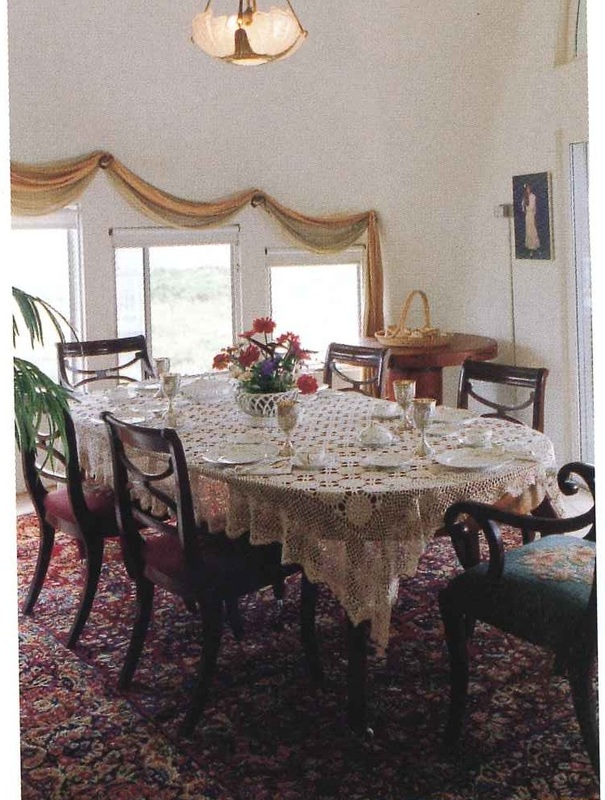 Below left: Facing the ocean, the dining room enjoys a spectacular view. 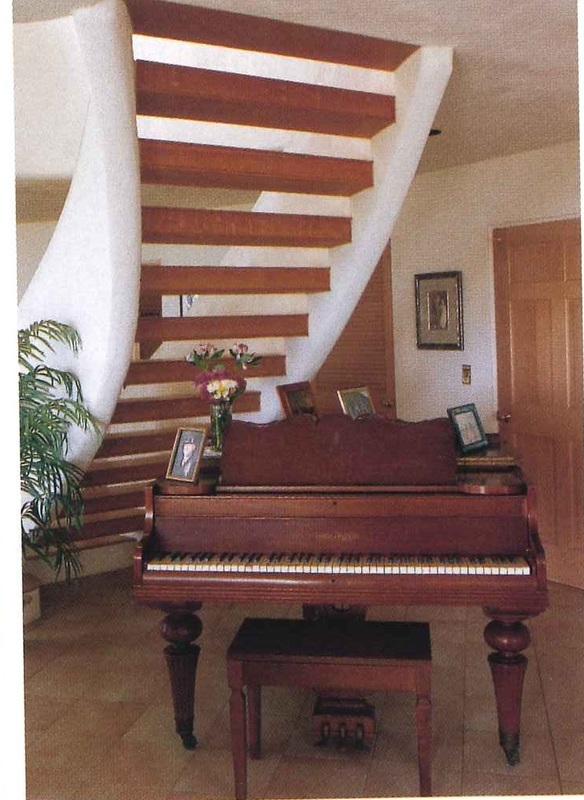 Below right: Mrs. Paul’s love of music is showcased in the piano nestled under the curved staircase leading to the third level. This entry was posted in Uncategorized on April 23, 2012 by Lee Ann Carter. The proud parents of five children and seventeen grandchildren, the Pauls were living on Sullivan’s Island in 1989 when Hurricane Hugo struck. “The last nail hadn’t even been pounded on the major remodeling project we were doing when Hugo came through and we lost everything,” Huiet says. Determined to rebuild, the Pauls enlisted help from their son, George. Taking his cue from shells found along the nearby beach, George sold his parents on the idea of a concrete monolithic dome in place of their previous traditional home. “I like to say the idea transpired after lots of coffee and late night drives,” George laughs. Construction started in 1991 and took a year and a half to complete. “We originally designed a round house but eventually because of the lot and the view we increased the linear footage and ended up with more of an elliptical shape,” says George. 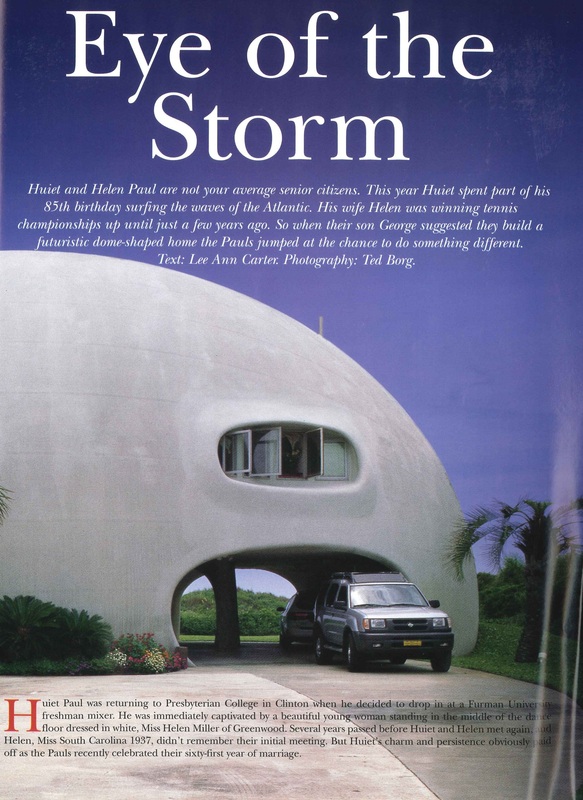 The Paul home is called Eye of the Storm and was designed to be indigenous to the seashore by reflecting the curve of the beach, the dunes, and the seashells. Eight huge openings, several of which are used as parking garages, along with storage areas, and a play area for the grandchildren, make up the home’s ground level. With its aerodynamic shape, wind and rain curve around and travel through these openings, eliminating pressure buildup. During a hurricane or tropical storm, these openings allow nature’s fury to pass through, leaving the structure unharmed. One-piece solid reinforced concrete and steel construction also means that Eye of the Storm can withstand up to a category five hurricane and any subsequent tornadoes. Concrete pilings were driven into the marl stopping one foot above the earth’s surface. One by two-foot reinforced concrete footings were poured on top of the pilings. 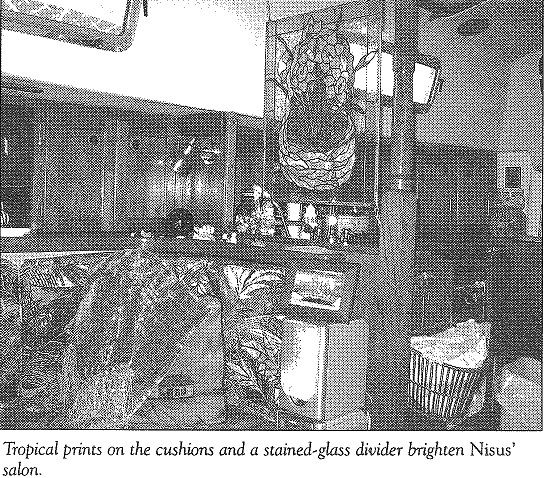 A nylon balloon-like fabric was then inflated to the desired size and shape and interlocked with the footings. Rubberized stucco mixed with walnut shells for added texture was used to finish the exterior, while the interior was completed by installing additional insulation, concrete, and stucco. 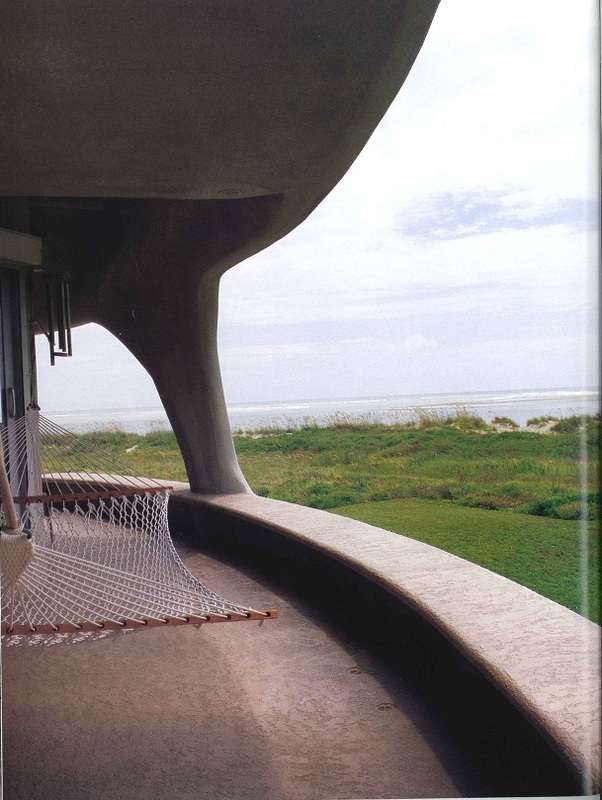 Cut into the exterior are several covered porches, each placed for a spectacular ocean view. Eighty feet wide and fifty seven and one half feet in length, the Paul home has three separate interior levels and a total of 3800 “round” feet. The three levels weigh in at 250 tons and hang from the dome’s main shell, basically holding the roof in place. The lack of a “traditional” roof, with no gutters, eaves, or overhangs lessens yearly maintenance. Because of design and construction materials Eye of the Storm is very energy efficient and interior temperatures are easily maintained with minimum cost. Ground heat is drawn up into the shell through the concrete slab and helps to keep the home at a comfortable temperature; while continuous ocean breezes flow through the seaside wall of windows. Exterior concrete stairs gently curve around the side of the home and lead into the main living area. This second level is home to a large open kitchen, dining, and great room, along with three guest suites each with a private bath. 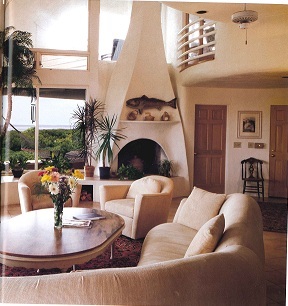 Running inside underneath all the ocean-side roll-out casement windows is a built-in concrete and stucco ledge topped with Italian tile showcasing the Paul’s thriving houseplants and sweetgrass basket collection. Outside covered porches feature the same type of ledge and provide plenty of additional seating when all the children and grandchildren are visiting. 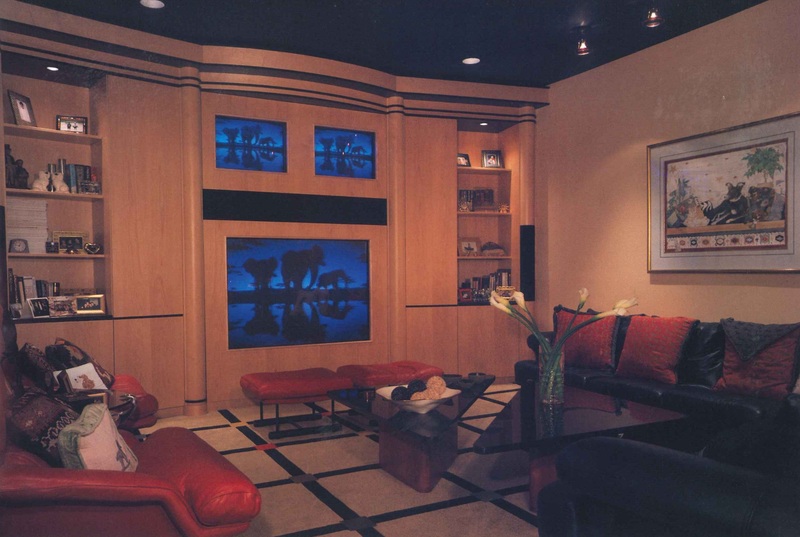 The great room has a wood-burning fireplace and a built-in-home entertainment nook both sculpted into the concrete walls while the home was under construction. Keeping with the circular theme of the home, the great room sofa sectional and separate reading chairs are all curved, along with the rounded kitchen center island. The Paul’s grandson, Ryan Krusac, owner of Ryan Krusac Studios, handcrafted furniture in two of the guestrooms. “While my grandparent’s home is very contemporary, we have a tradition of passing down family heirlooms so I took a long-term approach in my designs. I wanted a balance of modern and traditional,” Ryan says. An interior free-floating stairway leads to the third level and duplicates the exterior staircase. Helen and Huiet’s primary living quarters, complete with full kitchen and den are located on this level; affording them absolute privacy during family get-togethers. Branching off and surrounding the master bedroom is a separate double vanity area. A deep soaker tub is surrounded by windows and provides a spectacular view of the Atlantic. “Baths are my passion, and from here I have one of the best views of the ocean,” Helen says. Hidden in one of the rounded walls in an oversized shower room with tile benches. No shower door or curtain is required due to the location and design. Accessed from the kitchen/den area is yet another curving flight of steps leading to the fourth and final level. Now decorated as a guestroom, at one time it was Huiet’s office. “My oval office,” Huiet laughs. A large skylight is positioned directly over this fourth level. When the house was originally constructed the skylight could be raised and lowered for ventilation, but is now sealed glass. ‘During a storm with 93 mile per hour winds, the original skylight got sucked out,” Huiet says. While Eye of the Storm was conceived due to a horrific natural disaster, it has over the years become a source of harmony, tranquility, and peace of mind for Helen and Huiet. Not to mention they always have a sure-fire conversation starter. Left: Bedroom furniture, handcrafted by the Paul’s grandson, Ryan Krusac, was built proportionally for each unique guestroom. 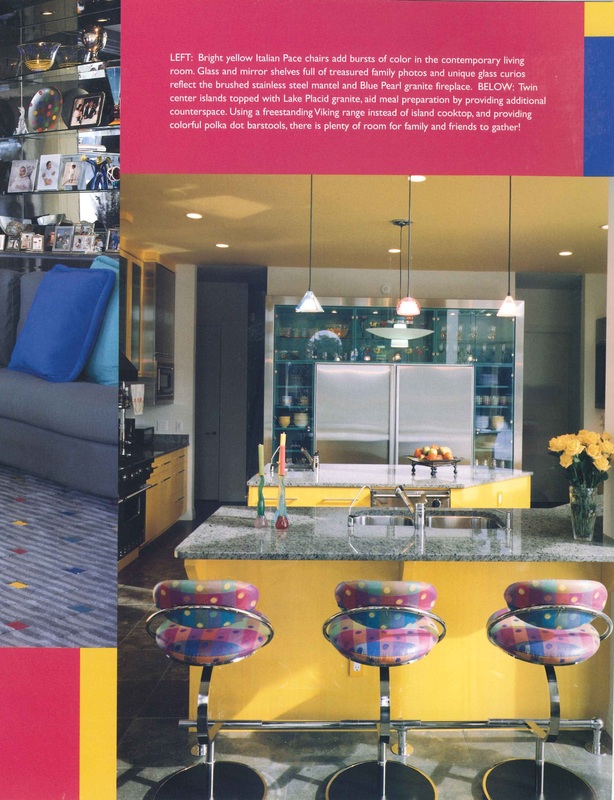 Right: Keeping with Eye of the Storm’s round shape, the kitchen’s center island and back of the bar stools are gently curved. This entry was posted in Carolina Homes & Gardens, Magazine Articles and tagged Charleston SC, Eye of the Storm, Helen Huiet, Lee Ann Carter, Miss South Carolina 1937, Paul Huiet, Presbyterian College, Ryan Krusac, South Carolina Homes & Gardens, Sullivan's Island on April 4, 2012 by Lee Ann Carter. 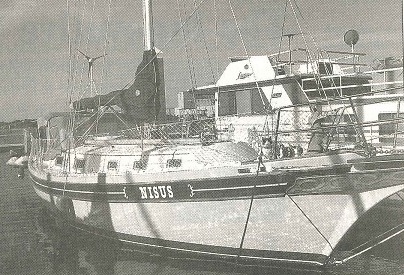 Nisus, a 36′ Bayfield, could have been named “dream boat.” She has all the style and comfort of a good liveaboard home. Have you ever had an idea that you decided to act on, no matter how crazy your family and friends thought you were? After a life of raising a child, taking care of a big house, and working 9 to 5 for someone else, I decided I wanted to experience living on a boat while supporting myself as a freelance writer. I learned that my new husband of two years, while gung-ho about living aboard, didn’t care for houseboats, and most of the trawlers we saw for sale were out of our price range. We looked at a couple of sailboats but weren’t impressed until the day we saw Nisus. Sitting on the hard in a Charleston, South Carolina boatyard, Nisus, a 36′ Bayfield sailboat, was everything we wanted in a boat. Lots of rich teak, a separate tub in the head, actual staterooms with doors that close, a boat built for long-range cruising–she was our dreamboat. The only problem was that I had never even been on a sailboat, and Marc’s sailing experience was limited to 16′ HobieCats. But we figured that we had learned a lot of other things in life, so we could also learn to sail. Before we knew it, the house was sold, 99 percent of our possessions either sold or donated to Goodwill, and a 5’x5′ storage room rented for personal papers and a few treasured family heirlooms. 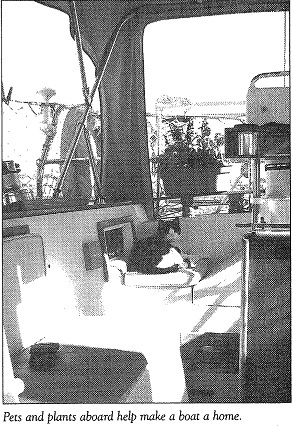 The Nisus was launched, and we moved on board with our four cats and two dogs. That was in the middle of October and we had mild weather for approximately six weeks. A 6″ desk fan placed in our forward berth helps with air circulation on those nights when we can sleep with the hatches and portholes open. 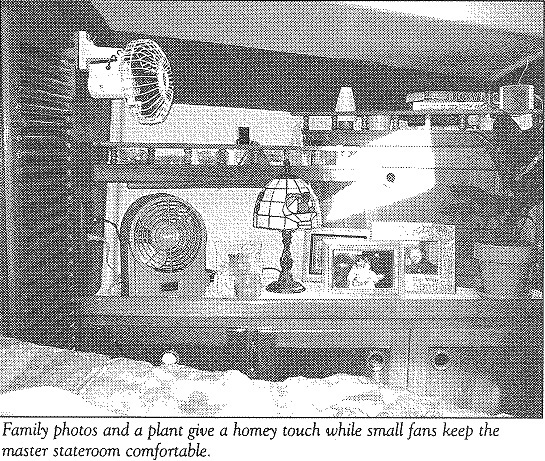 An added plus of the fan is the white noise it provides, blocking out the noise of the animals, pumps starting up, boat creaks and groans, and marina sounds in general. The first cold night hit on a windy Saturday and since I wasn’t comfortable with the factory-installed Force10 diesel heater, we purchased an electric ceramic heater the next day from Walmart. While it did warm things up, I didn’t feel safe using it around all the animals–plus we were having increasing problems with condensation. When we first decided to move onto a boat we agreed that we would commit to a year of boat life before making any major changes to the vessel. After six weeks aboard, we had already adjusted so well that we knew we could do this long term and we started checking into Cruise-Air heating and cooling systems. We had already planned on living in a marina the majority of the time, so being tied to shore power for the system to operate was no problem. We hired a local installer, and less than two days later Nisus was toasty warm. Plus that annoying drip drip drip from the porthole onto Marc’s face when he was asleep on his side of the berth was gone. The Cruise-Air system wasn’t inexpensive, but it was money well spent. Though I didn’t realize it at the time, I think installing this system was the first step in making our boat a real home. One of the things we definitely wanted was a custom mattress. We are in our mid-40’s and accustomed to the creature comforts of life. Sleeping on a big piece of foam wasn’t for us. An ad in Living Aboard caught my eye and I contacted Bob Walters, owner of Your Design Mattress Factory in Cleveland, Ohio. After a series of phone calls and e-mails, we had a custom mattress complete with inner-springs and a wonderful pillow-top–just as good, if not better, than our queen-sized Sealy at home. While it wasn’t cheap, it was worth every dime. Plus, working with Bob was a pleasant experience–he was able from our rough template to construct a mattress that fit perfectly. In one of those liveaboard tip books I had seen a suggestion about using a two-person sleeping bag with sheets that zipped in for berths that were unusually shaped. It did the trick, but it really wasn’t comfortable, and after a while had too much of that “camping out” feeling. When the spring cleaning/redecorating bug bit me, I started experimenting with different sizes of sheets and mattress pads. After some trial and error, I found that a queen-size mattress pad worked. Since it was wider than the actual mattress, I could stretch it enouh to get it to fit length-wise. For bed linens, I purchased two full-size flat sheets and used one as a bottom sheet–there is enough extra material on the sides to stay tucked in. For the winter I used a dark red, green and blue plaid comforter on our berth. It looked great with all the dark wood, but come spring I wanted something cheerier. A bright yellow and blue comforter with matching pillow shams was perfect. Since the comforter was one of those “bed in a bag” deals, complete with a set of sheets, I purchased an additonal flat sheet and used the fitted sheet to make a shade for the hatch over the berth and to cover the stateroom’s seat cushion. The salon cushions were all original and looked dated, so at a fabric store I found a Sunbrella fabric in a tropical print. It brightened up the entire salon and is durable enough to withstand the dogs and cats. I plan on using the same fabric to cover the interior part of the mast. With discount-store pillows and a couple of inexpensive chenille throws, the salon is now the perfect place to curl up and enjoy a good book or take a mid-afternoon nap! Our head is a bit different from that found on most sailboats. We have a bathtub, which eliminates having to get the entire room wet when showering. While the tub isn’t full sized, it is large enough to sit in comfortably, and the two-tiered ledge inside the tub is perfect for storing shampoos and soaps. A colorful shower curtain, toilet-seat cover and small rug, along with matching bath accessories such as a soap dish, lotion dispenser and toothbrush holder, make the head feel as inviting and comfortable as the oversized master bath in my last home. These few accessories were inexpensive and have considerably brightened up that area of the boat. I gave away the majority of my plants when we sold our house. I have started accumulating inside plants again, only this time they are smaller and don’t require a great deal of maintenance. Sitting outside on the transom are two plastic pots full of salmon-colored geraniums and an assortment of colorful spring flowers. In the cockpit are baskets of Swedish ivy and a Christmas cactus that I had brought from our house. It bloomed for the first time in years during our first Christmas on the boat. I took that as a good omen! These plants require little care and add a “homey” touch. Marc and I are big fans of a North Carolina potter and have quite of a collection of his work. I was adamant about being able to use these handcrafted serving bowls and coffee mugs on board. I also decided that, since Nisus was going to be our home, I did not want to feel as though we were camping out. We use real china and good silverware. While we do use insulated plastic tumblers for drinks, they are the same glasses we used in our last house. I must admit, cooking in such a small space on a propane stove has taken some getting used to, although I have now become quite the boat chef. I found a small crock-pot that is just large enough to cook soups or stews for two people with a minimum of leftovers. Shopping at the mall one day, Marc discovered a wonderful appliance made by Westbend. It is a removable four-quart slow-cooker heated by a Teflon-coated base that can be used to grill two sandwiches or fry a couple of eggs. The glass lid can be turned over and used as a steamer for fresh vegetables or as a serving bowl. It also came with a handy insulated cover complete with handles, perfect for those casual marina potlucks. All pieces fit together and take up less space than my electric frying pan. It’s a very useful and versatile appliance to have on a boat. Pictures, family photos, books, candles and my collection of miniature pigs are found all over the main salon and our stateroom. Even though nothing is velcroed or siliconed down, it still takes less than half an hour to secure everything in order to go sailing. By the time Marc gets things ready to go topside, I can have everything down below put up, tied down and secured. Finally, we try to remember that what really turns any place into a home–whether boat, apartment, or 20-room mansion–are the people who live there and their attitudes. Marc and I take extra care to respect our limited amount of personal space. While living aboard is something we both wanted to do, it was, and at times still is, stressful. We try to keep a positive mind-set and a ready sense of humor. We may not live on a boat for the rest of our lives, but we are going to enjoy it for as long as we can. If and when it ends, we will move on to something else. Living aboard is another life experience–one that I am thankful to have. After full-time boat living for almost a year now, life only keeps getting better and better. I hope these inexpensive and easy tips will help to make your boat comfortable and feel more like a home. This entry was posted in Boats and Sailing Articles, Living Aboard Magazine and tagged Bayfield, Charleston SC, Cleveland Ohio, Cruise-Air, Force10, Lee Ann Carter, Living Aboard Magazine, Sunbrella, Your Design Mattress Factory on October 12, 2011 by Lee Ann Carter. In 1992 while Bee and Walt Grabowski were building their first home in Beaufort, Bee knew what she wanted for tile but was unable to find it. Bee finally located a handcrafted English tile, but when she went to purchase it, the shop owner was stunned that anyone would buy that quantity, at that price, simply because they liked it. Fast forward to 1998 and Bee, while renovating another home, discovers that Sea Island Tile is for sale. Walt is tiring of corporate life and looking for a change, so it wasn’t long until Sea Island Tile had new owners. In business six years at 391 Sea Island Parkway in Beaufort, and three years at 6-B Plantation Park Road in Bluffton, Sea Island Tile also opened a separate stone fabrication shop in 2002. 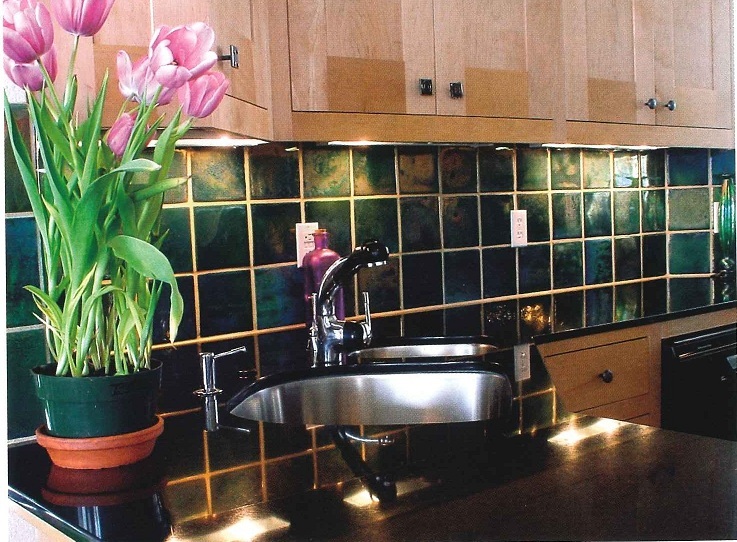 Artistic tile in this country has a rich history At the turn of the century many homes were constructed around the tile design with the tiles being handcrafted by skilled artisans. Small, primarily family-owned tile companies turned out distinctive tile until the Great Depression forced the majority of them to close. With the housing boom that began after World War II and continued through the late 1960’s, tile became a bland mass-produced item offering no character or detail. 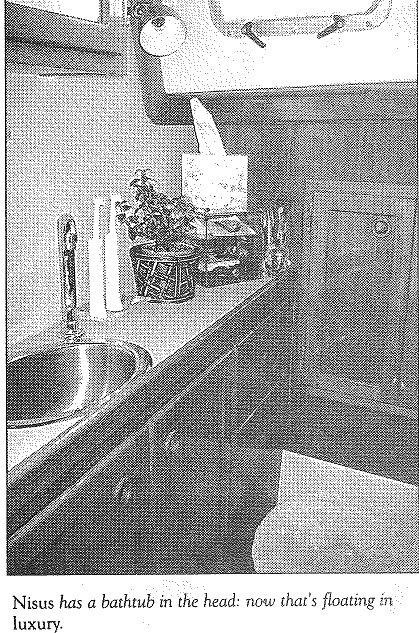 Homeowners used color, (remember black, white and pink-tiled baths?) in place of design and texture. Sea Island Tile also carries a complete selection of natural stone and slate. 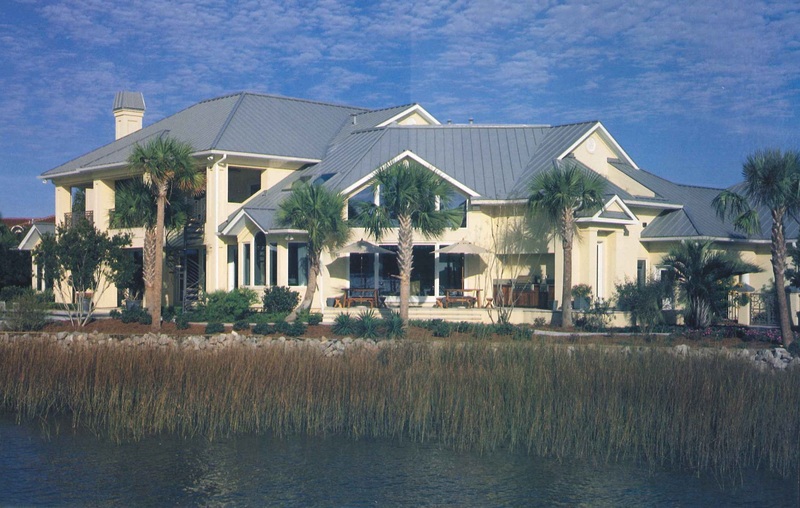 Representing the best in the business, from Walker Zanger to Bedrock Glass, Sea Island Tile believes that a client’s choices are only limited by their imagination. No matter what the decor, modern rustic to a particular period look, Sea Island Tile offers the widest tile selection in the Lowcountry. Owning their own stone fabrication shop allows Sea Island Tile to do what the others can’t. Countertops, fireplace surrounds, stair treads, even sinks and stone furniture can all be created at Sea Island Tile. Customizing sinks with relief features matching the surrounding tile has become a popular look and is one of Sea Island’s most requested items. Sea Island Tile offers clients the convenience of one-stop shopping. Looking for a simple builder’s grade 6×6 tile for the laundry room floor in addition to a granite slab for the kitchen counters? Sea Island Tile can supply an entire home’s stone needs. They also carry a complete line of setting materials and tools. A big part of Sea Island Tile’s success must go to their wonderful employees. Sadie Hanson runs the Beaufort location and is also the corporation manager. Kevin Yates oversees the Bluffton store, while Bee is CFO and Walt takes care of the fabrication shop. 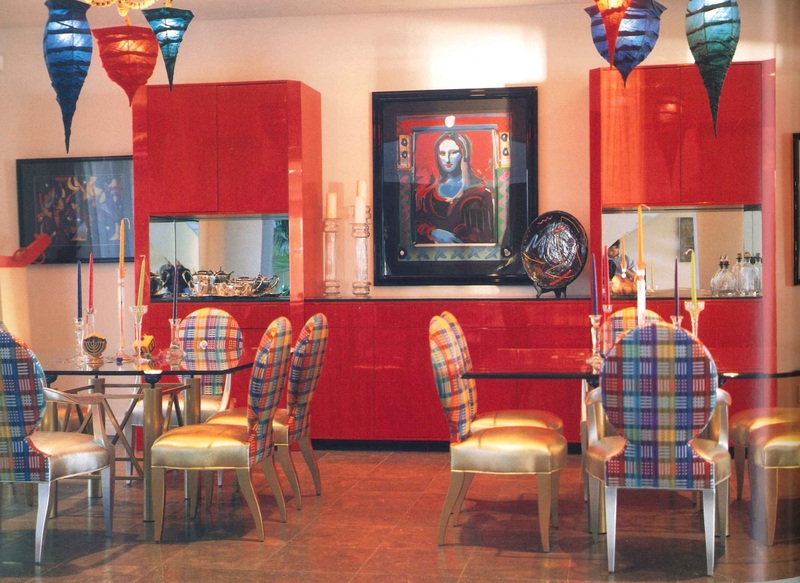 This entry was posted in Carolina Homes & Gardens, Magazine Articles and tagged Beaufort SC, Bedrock Glass, Bee Grabowski, Bluffton SC, Kevin Yates, Lee Ann Carter, Sadie Hanson, South Carolina Homes & Gardens, Walker Zanger, Walt Grabowski on September 20, 2011 by Lee Ann Carter.